Yes. Always! Variety is the spice of life, my friend. 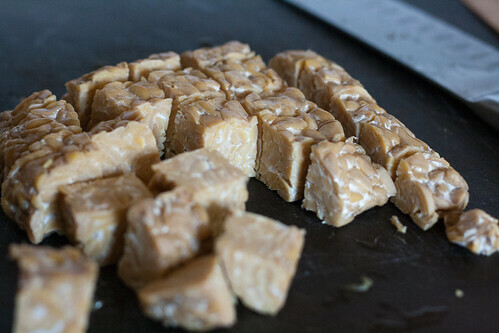 And tempeh, like tofu, is excellent if you take the time to do it right. *Don’t roll your eyes at me. Tempeh can totally be comfort food! Sorry, that was my mom sass coming out. and spices. I threw it in a bag and let it marinate for 15 minutes. It’s hard to get the flavors to soak into the tempeh, so if you really want it saturated, allow it to marinate in the fridge overnight. I did not plan that far ahead. Then I followed standard stir fry procedure. Just the right amount of sauce, and full of fresh vegetables. 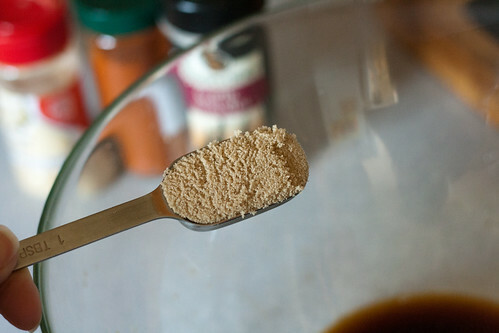 Place the tempeh, juice from one orange, 1/4 cup soy sauce, brown sugar and spices into a ziplock bag. Allow it to rest in the fridge for at least 15 minutes, or overnight. 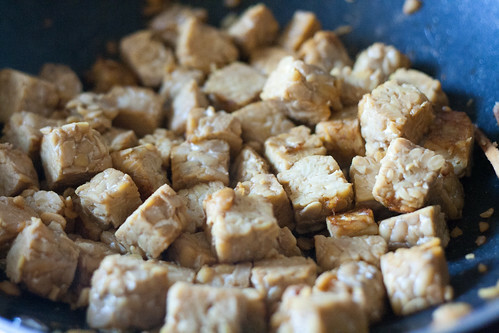 Remove the tempeh, but save the marinade. Heat an oiled wok or non-stick skillet over medium high heat. 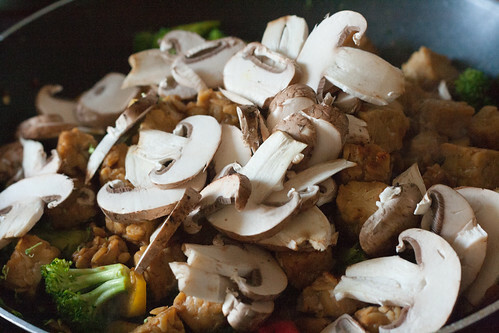 Add the tempeh and stir fry until lightly browned on all sides. Remove the tempeh and set it aside for now. Heat a teaspoon of oil in the wok and then cook the vegetables until tender crisp. About 3-5 minutes. Add the tempeh and remaining marinade to the vegetables. 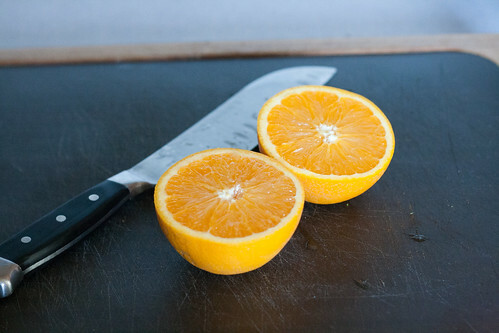 Then pour in the remaining orange juice and soy sauce. Feel free to add more spices at this point as well. Cook until very hot, making sure that all the vegetables get covered in the sauce. Serve over rice, quinoa, or by itself. 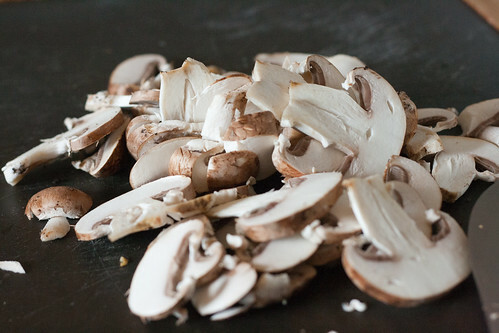 I kept eating this thinking that bok choy would be delicious in here, and if you hate mushrooms, leave them out. 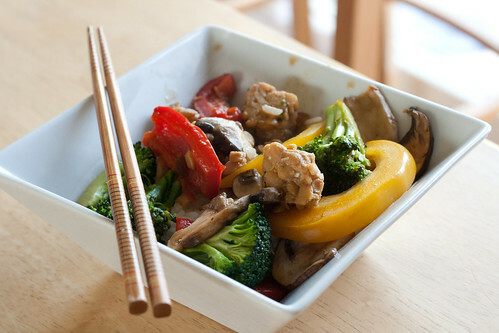 Stir fry is an excellent way to just use up whatever you have. 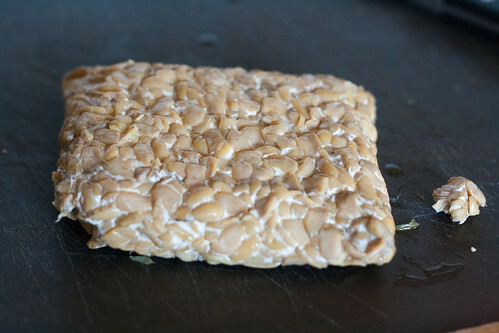 Remember, don’t be scared of tempeh if you’ve never had it before. Let me know what you think! It should be available in any health food store, but you can always call ahead to make sure. I hope you find some!